This past week when your most recent issue was delivered to my office I noticed a grave error on the cover. Normally I wouldn’t take the time two write in, but this error was so egregious I felt a moral obligation to help you make a correction. You see, this week’s cover showcased a picture of Hollywood A-lister Gwynneth Paltrow with the heading “World’s Most Beautiful Woman!” Now I don’t have anything against Ms. Paltrow. I’m sure she’s a very nice person and she certainly is a lovely looking lady. I can see how your editing staff would be tempted to crown her “World’s Most Beautiful Woman!” but when they were considering candidates, I suspect they were unaware of another, lower-profile woman. 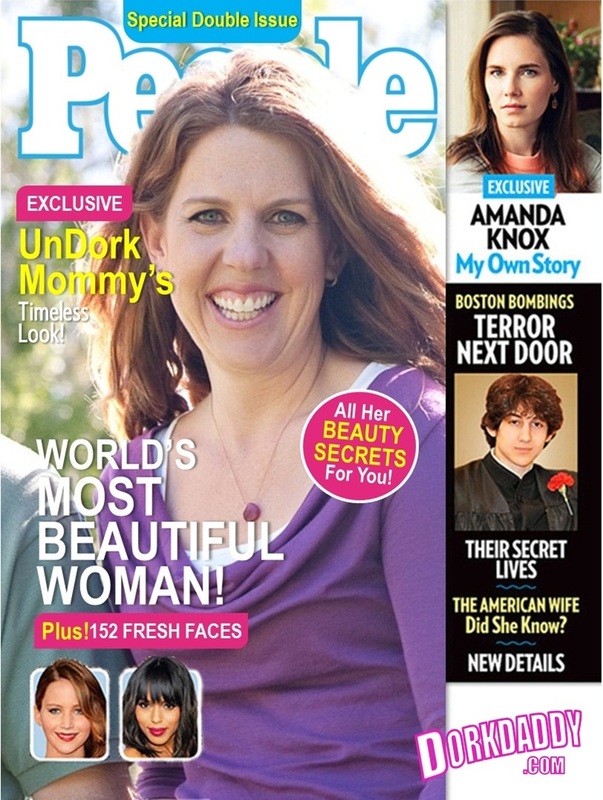 UnDorkMommy isn’t a movie star, and for that reason I can forgive your editing staff for being unaware. Had they known her I’m sure they would have made a very different choice for this week’s cover. I have taken the liberty of mocking up a correction for your editing staff. No doubt as soon as you see it you will want to recall all of last week’s issues and publish a re-print with the more accurate cover I have provided below. Please send my regards to Ms. Paltrow. When she sees how beautiful UnDorkMommy is I’m sure she’ll agree a correction needs to be made. This is the best blog post I’ve read in a long time. Terrific post! I can’t begin to express how much I love this. I’m voting for UnDork Mommy! You are the best husband and father… no really… well, after my husband, of course. Anyway, well done! You’re nice to say that, but keep in mind I’m the schlump who hasn’t been home to put my kids to bed for the last 3 nights. I might suggest this technique the next time Charlie Capen complains about 187 days. Aw this is sweet. Mothers Day gift? Righteous outrage at a grave injustice done to my wife by the people at People. Nothing more. 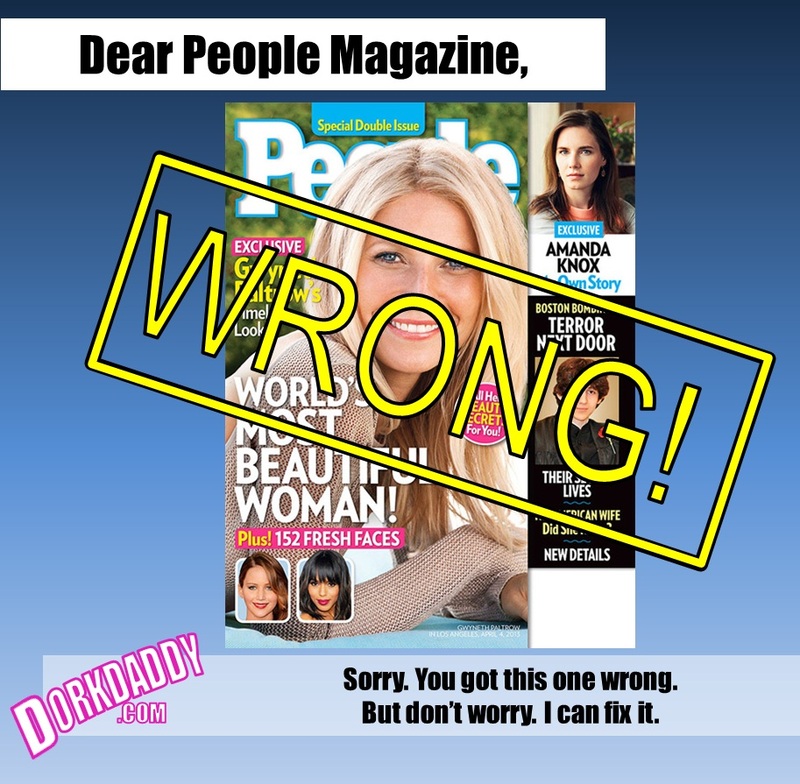 A perfect example of what is wrong with tabloid magazines. Too focused on the “celebrities” to get their facts straight. Nicely done. Daddydork, you’re the best. I don’t think this is ‘sweet’, I think it is brilliant and true. Undork Mommy is gorgeous.